President Trump just finished a wide-ranging press conference where he took questions for close to an hour before leaving Sentosa Island en route to Paya Lebar Air Force base to fly out on Air Force One. 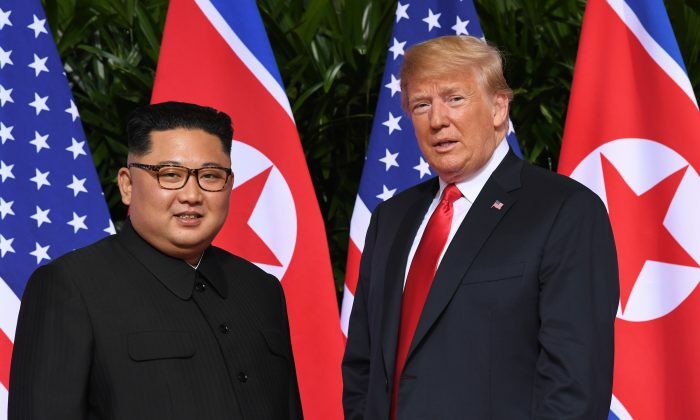 Trump expressed optimism and confidence that Kim Jong Un will follow through on his commitments; primarily denuclearization. Trump said Kim has a “very substantial” amount of nuclear weapons, but that Kim is committed to denuclearization in a process Trump said would be completed as physically and mechanically fast as possible. Sanctions will remain in place for now, but Trump said the “war games” military exercises that the U.S. holds with South Korea will be cancelled. He said he is certain Kim is sincere in his desire to be nuclear-free and to usher in peace and prosperity for North Koreans. On human rights, Trump said he did bring the topic up, although the conversation was brief compared to the talks on denuclearization. The president said he believes the summit would not have happened had it not been for the tragic death of Otto Warmbier. Warmbier died in June last year, just days after North Korean regime sent him home in a coma after holding him in prison for 17 months. Trump said he has helped the North Korean people by meeting with Kim. Trump said next week he will get together with National Security Adviser John Bolton and his team to go over details of the next steps. Trump and Kim shared a final handshake before Kim left the summit. Trump was asked what surprised him most about Kim. “Great personality and very smart—good combination,” Trump said, adding that he is a worthy negotiator. Trump said he and Kim will “meet many times” in the future. 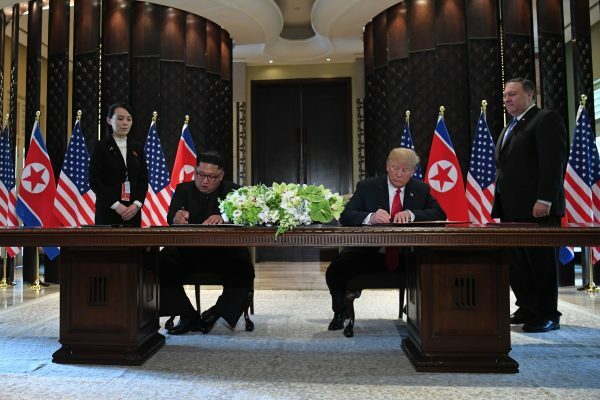 Trump and Kim signed three documents, which Trump called “comprehensive,” without elaborating. He said the documents’ contents will be released at the press conference this afternoon (scheduled for 4 p.m. local time). He said he wanted to express his gratitude to Trump for making the meeting happen. Trump said the denuclearization process was starting “very quickly” and that “absolutely I will” invite Kim to the White House. Trump and Kim emerged from lunch and are heading to sign a document, however neither would say what it contained. 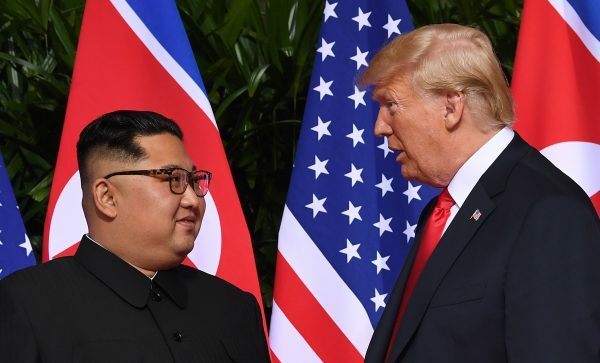 Kim ignored questions about whether he would denuclearize or open up his prisons. President Donald Trump, Secretary of State Mike Pompeo, Chief of Staff Gen. John Kelly, National Security Adviser John Bolton, White House Press Secretary Sarah Sanders, U.S. Ambassador to the Philippines Sung Kim, and Deputy Assistant to the President for Asian Affairs Matthew Pottinger. On the North Korean side will be Chairman Kim Jong Un, Vice Chairman Kim Yong Chol, Vice Chairman Ri Su Yong, Minister of Foreign Affairs Ri Yong Ho, Minister of People’s Armed Forces No Kwang Chol, Vice Minister of Foreign Affairs Choe Son Hui, First Deputy Director Kim Yo Jong, and Director Han Kwang Sang. The menu includes starters traditional prawn’s cocktail served with avocado salad, green mango kerabu with honey lime dressing & fresh octopus, and Korean stuffed cucumber. Main dishes include beef short rib confit, served with potato dauphinois and steam broccolini, red wine sauce on the side, and sweet & sour crispy pork with Yangzhou fried rice with homemade XO chili sauce, and soy braised cod fish with radish and Asian vegetables. Desserts include dark chocolate tartlet ganache, Haagendazs vanilla iced cream with cherry coulis, and tropezienne. Trump and Kim had an approximately 38 minute conversation, finishing at 9:50 a.m. They emerged from the meeting, where only translators were present, and walked to an expanded bilateral meeting. 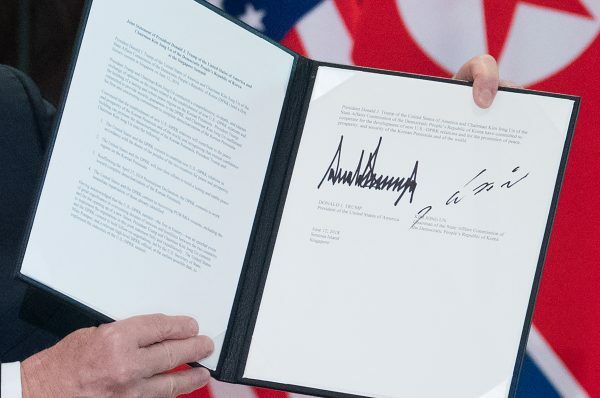 Aside from the two leaders, attendees of the expanded bilateral include: North Korean vice chairman Kim Yong Chol, North Korean foreign minister Ri Yong Ho, former North Korean foreign minister Ri Su Yong, and a translator. On the American side are National Security Adviser John Bolton, Secretary of State Mike Pompeo, Chief-of-staff John Kelly, and a translator. 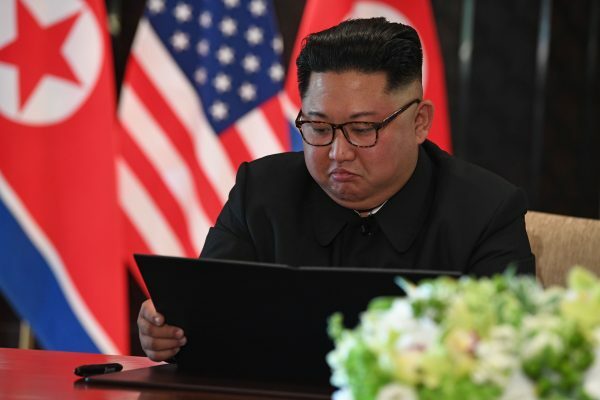 Kim was asked at least three times if he would denuclearize, but declined to answer. 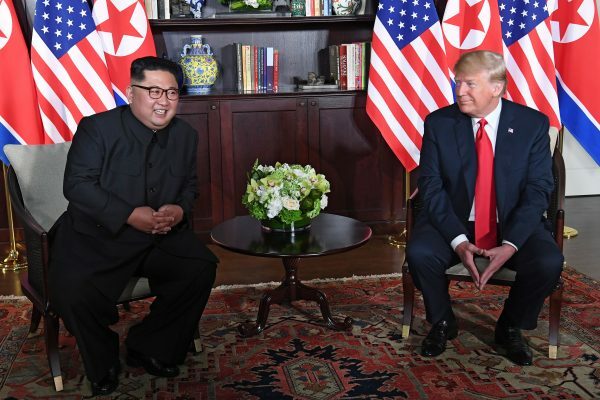 After meeting Kim and shaking hands, Trump was asked how he felt in the first minute. “I feel really great. We’re going to have a great discussion and, I think, tremendous success. It will be tremendously successful. And it’s my honor. And we will have a terrific relationship, I have no doubt,” he said. 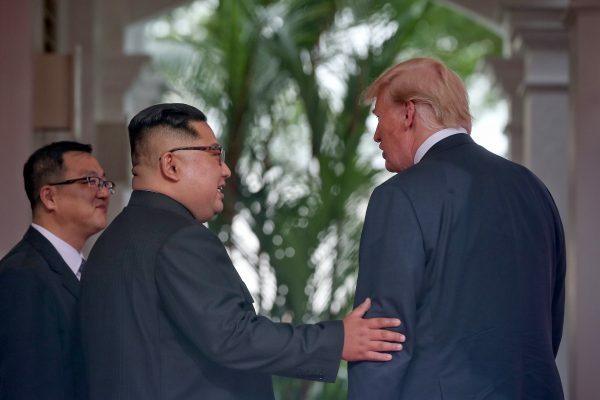 SINGAPORE—President Donald Trump and North Korean leader Kim Jong Un began their much-anticipated summit on Tuesday morning in Singapore. It is the first time a sitting U.S. president has met the current dictator of the North Korean regime. Ahead of their meeting, the two leaders shook hands before making a few brief remarks before the media. They are having a one-on-one meeting, with only translators present, followed by a bilateral meeting with each having staff present, and a working lunch. 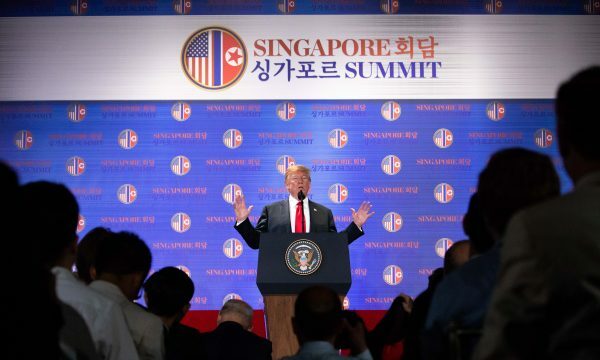 Trump will speak to media after the summit at around 4 p.m. and plans to depart Singapore at about 8 p.m. local time. 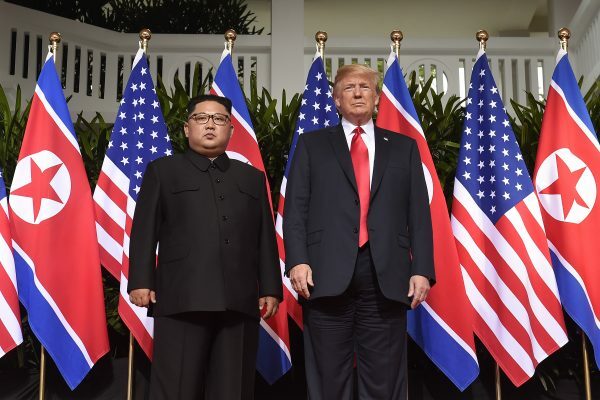 Trump has demanded the complete denuclearization of North Korea in any deal going forward. 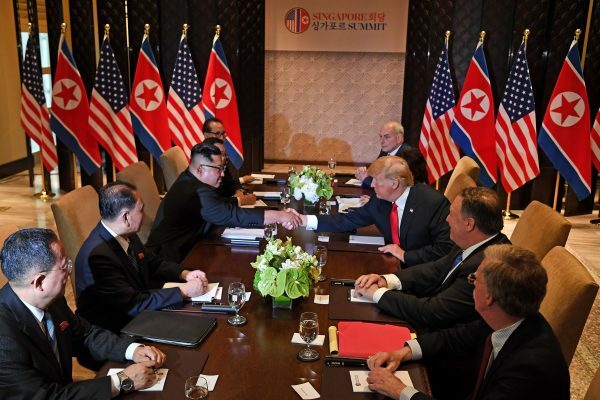 After a year-long pressure campaign on the North using diplomatic, economic, and military means, the Trump administration was able to force Kim to the negotiating table. Ahead of the meeting North Korea released three American hostages and destroyed one of its nuclear test sites. North Korea radically changed its position toward the United States in recent months following a secret meeting between Pompeo and Kim in Pyongyang in early April. 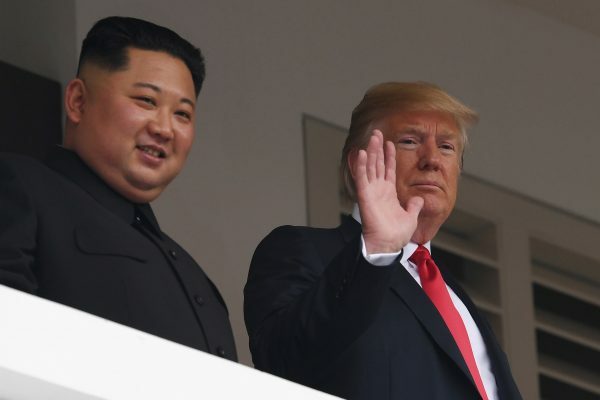 Before then North Korea repeatedly threatened to attack with nuclear weapons the United States and its allies in the region, South Korea, and Japan. During a speech in South Korea last year President Trump offered North Korea a path forward if it was willing to abandon its nuclear weapons. “President Trump believes that Kim Jong Un has an unprecedented opportunity to change the trajectory of our relationship and bring peace and prosperity to his country,” Pompeo said. Pompeo hinted at a press conference in Singapore the day before the summit, that the two leaders may sign something. “At the end of the day, both countries are going to have to come to have sufficient trust in each other and to do the verification that each country needs that we’ve provided the things that are called for that we commit to in the various documents that we sign, both tomorrow—if we sign a document—and if we sign subsequent documents,” he said.